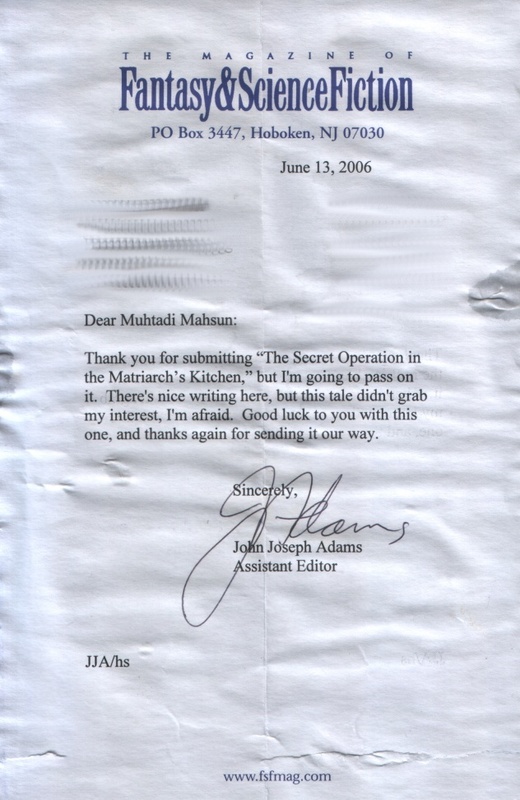 Ted Mahsun: Rejected by Fantasy & Science Fiction Magazine. Try Locus magazine then. Or Dragon. It's possible to try some smaller newszine or fanzine that's related to sci-fi and fantasy. Don't ever give up, Ted. If you like, you can send over your story for me to beta. Your writing, as I mentioned earlier in The Water Tower, is always nice. You have to just plot a little bit more for your stories. Remember, it's got to be exciting every step of the way and the reader has to want to go on. Things HAVE to happen, vividly and dynamically. It's got to GRAB the editor. Swifty: Thanks for the suggestion! But I think neither Locus nor Dragon accept short story submissions. No problems though... I'm sure I'll find some suitable candidates in my copy of Novel & Short Story Writer's Market 2006. I'll thumb thru it later when I can steal some time. Sharon: No time for shedding tears when there are manuscripts to be sent out and stories to be written and rewritten! None of this spilt milk shenanigans for me! Hah! I have thought of joining a critiquing group, I just haven't found one that I've taken a liking to yet. I shall try the one you suggested, Sharon. Thanks! Hi Ted! Good to know that you are in good spirit and will be sending your work out again to other publications. 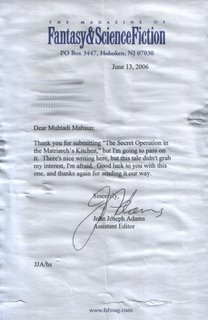 Allow me to share one success story of a previous rejection. I used to contribute articles to the newspapers. There was one that I particularly liked but was rejected by the paper that usually published my work. I was upset because I thought it was good. After the 'dust of indignation' settled, I sent it to a publication overseas and it was accepted. That was four years ago, also the first time my work was published by a publication that has circulations in S'pore, M'sia and the Phillipines. The lesson is, never give up. Sometimes, one man's poison is another's meat. Thanks for the great story, Yvonne! I think rejection really has to be taken in stride and to consider it a step closer to being published.